Al Muratsuchi's supporters gather at the opening of his new campaign headquarters in Torrance. 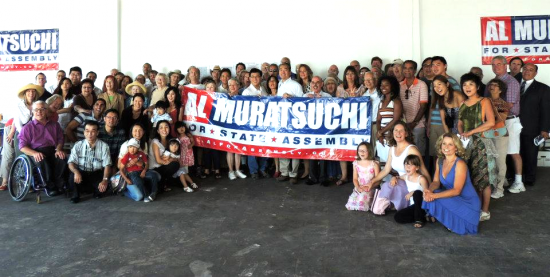 A reception supporting Al Muratsuchi, the Democratic candidate in the 66th Assembly District, will be held Thursday, Sept. 27, from 6 to 8 p.m. at the Japanese American Cultural and Community Center, 244 S. San Pedro St. in Little Tokyo. Muratsuchi, the top vote-getter in the June primary, will face off with Republican businessman Craig Huey in November. 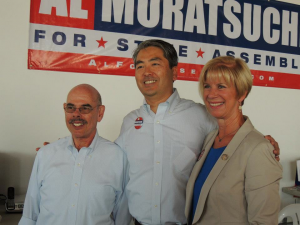 Al Muratsuchi with Reps. Henry Waxman (D-Los Angeles) and Janice Hahn (D-San Pedro). The district, which includes Gardena, Torrance and the Palos Verdes Peninsula, is 24 percent Asian and Pacific Islander, with Japanese Americans forming the largest Asian ethnic group. “This is one of the most competitive races in the state,” event organizers said in a statement. “With our help, it’s a winnable race. “As a Torrance School Board member, Al has a proven record of being fiscally responsible and saving for a rainy day — values he learned early on from his Nisei father and Issei mother. As a state prosecutor with the California Department of Justice and a Torrance School Board member, Al is running to fight for good jobs, good schools, safe neighborhoods, and a clean and healthy environment. “He has also served as the JACL Pacific Southwest regional director, board member of the Little Tokyo Service Center, and member of the U.S.-Japan Council. Honorary co-chairs of the event are Mineta, Assemblymember Warren Furutani and former Assemblymember George Nakano. Co-chairs are Ernest Doizaki, Gerald Fukui, Toshio “Terry” Handa, Thomas Iino, Kenneth Inouye, Bill Imada, Lillian Kawasaki, Patti Kinaga, Joshua Morey, Audra Mori, Henry Ota, Dr. Paul Song, Bill Watanabe, Peter Wong and Mike Yamaki. Muratsuchi was recently endorsed by Palos Verdes Estates Mayor George Bird, former Lomita Mayor Mark Waronek, Torrance City Councilmember Bill Sutherland, and Water Replenishment District of Southern California board member Rob Katherman, all of whom supported Republican Nathan Mintz in the primary; Manhattan Beach City Councilmembers Amy Howorth and Richard Montgomery; Redondo Beach City Councilmember Bill Brand; and the California chapter of the National Organization for Women (NOW). The grand opening of Muratsuchi’s new campaign headquarters in Torrance was held on Sept. 8. Among those showing their support were Reps. Janice Hahn, Maxine Waters and Henry Waxman; Assemblymembers Furutani and Betsy Butler; and State Controller John Chiang. 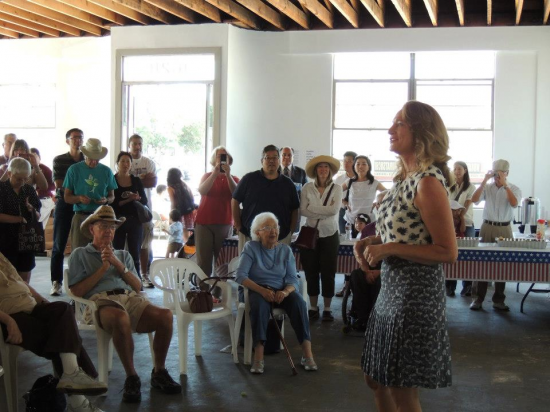 Assemblymember Betsy Butler (D-El Segundo) addresses Al Muratsuchi's supporters. I have met Huey and he is dangerous as far as his extreme beliefs. He wil; always choose the bible over our constitution. it is the main reason he lost when he ran for congress. nothing has changed. he must be shown for what he is. the huey satan letter shgows exactly what i am saying. many local residents know this about him, all of this district must be told the truth.